I had planned to drive, but with the snowstorm they said was coming I opted for mass transit. 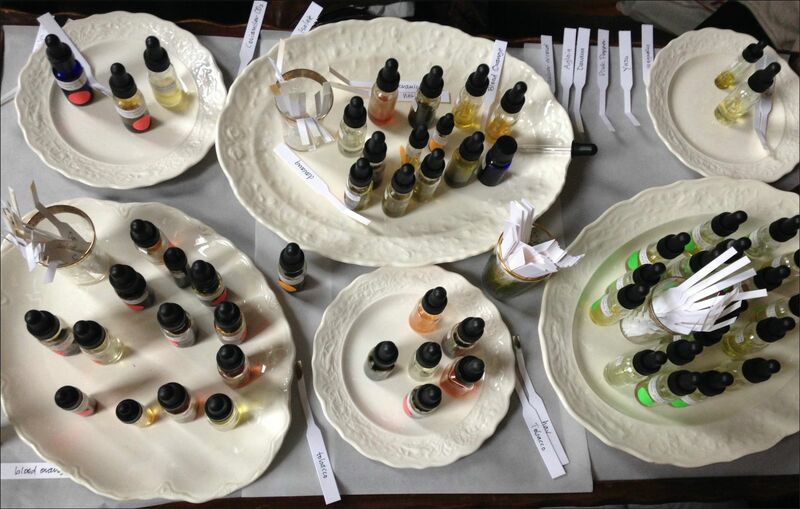 Two trains and two subways later, I was on the doorstep of Herbal Alchemy in Brooklyn, to take the second part of Julianne Zaleta’s Natural Perfuming class. I met Julianne when I was her assistant for part 1 of the class. Since I have problems wearing synthetics, I’ve been purchasing and making naturals perfumes. After we hugged hello and caught up, I sat down at a small table with a few more students and many bottles. The bottles were divided into top, middle and base notes. We went over them all and learned how each essence has a top, middle and base note (or dry down). We smelled Bitter Orange at 15 minutes intervals to take notes on how the essence changed with time. We talked about vertical chords and horizontal chords. Then Julianne introduced a few more naturals for us to work with. Hay, Vanilla, Ambrette, Aglaia, Magnolia Flower, Pear Isolate, Pink Pepper, Coriander CO2, Yuzu and Blood Orange. 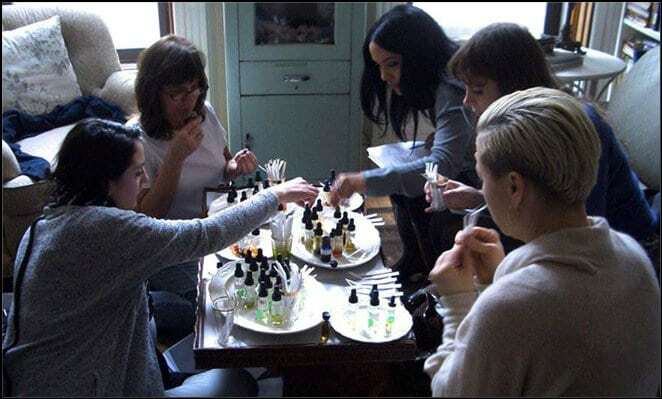 Our first assignment was to create a perfume based on Hay and Ylang Ylang. This wasn’t easy for me because I’m not fond of either scent. I used the Hay, and some Peru Balsam and Sandalwood as a base, Ylang Ylang, Jasmine and Rose for the middle notes and Blood Orange, Bergamot and Fir needle as my top notes. We smelled and critiqued each other’s creations. It was interesting to see how those two scents I didn’t like could be used to create a perfume I did like. 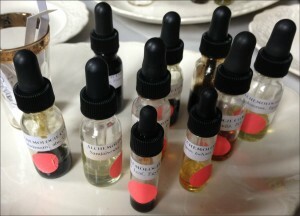 When the different essences are blended together, they become more than the sum of the parts. They truly do create a new scent. Next, we each choose a base and middle note to work with. I chose Rose and Patchouli because I love how they smell together. I made a base chord of Patchouli, Peru Balsam and Labdanum, added Rose Damask and de Mai along with some Jasmine for the heart of the perfume, and finished it off with Rosewood, Bitter Orange and Bergamot. Love, love, love this one! I will let it age for a while and steal some sniffs while waiting. The afternoon ended much too soon, but I now have 2 perfumes to smell and to remember my day in the most fragrant place in Brooklyn.